This Thomas Flynn Fr. 774 "battleship" note was sold for $6,037.50 in April of 2008. 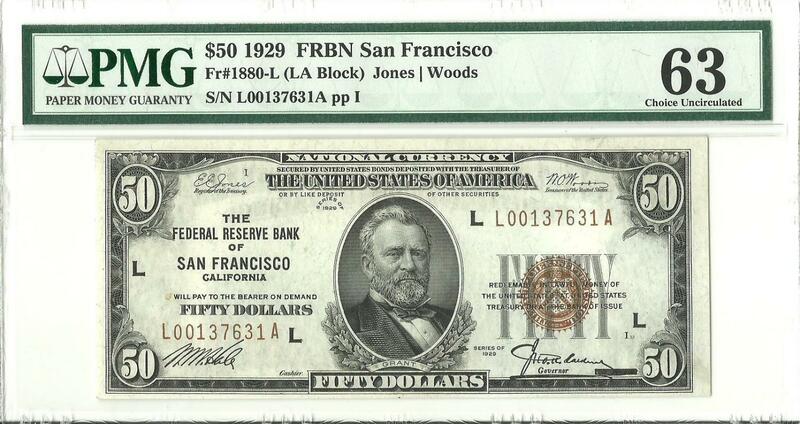 The same note sold for $4,312 in 2014. I just picked it up at auction for $3231.75. This is 46% reduction in 9 years. I wish there would be a really good article on how much the currency market has softened quite a bit. One vendor says the premium for low serial number specimens has dropped out the bottom. 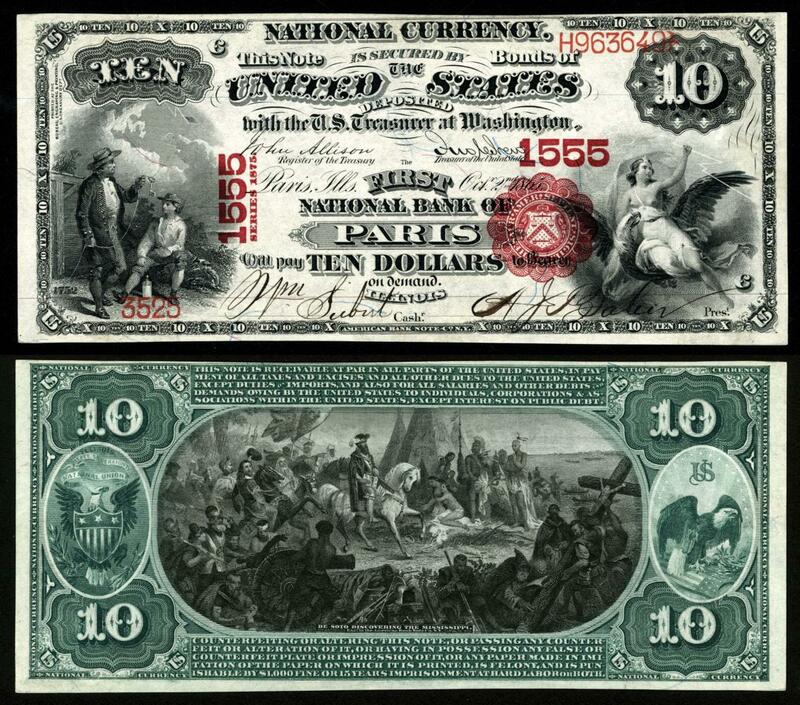 Interesting since there are Bison notes and other low serial number notes still going for several hundred thousand dollars up to over a million. 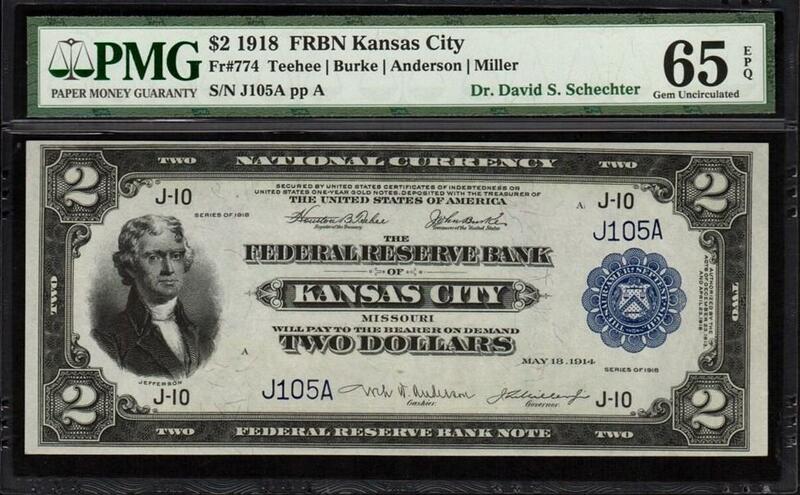 It seems one needs to be really careful with the premium on low serial number notes. I never thought it was worth it anyway. I thought it was an interesting and nice feature to have but never bought notes for any serial number feature (low #, ladders, radars etc....) Happy collecting. All I can say is WOW, what a beauty! I agree; fancy serial numbers are cool, but in my unprofessional opinion are not worth much of a premium, especially on such a rarity. This note would be amazing with any serial number. I also agree with Sheck_Shiek 100%. 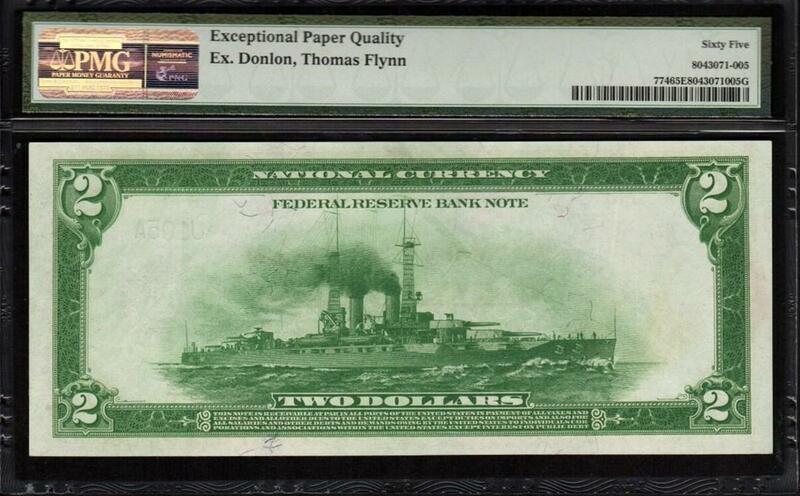 I guess since I mostly purchase obviously circulated Nationals and scrip, I have so far lucked out, but I would never buy an ungraded allegedly uncirculated note from Ebay. I don't even feel comfortable selling raw notes myself. Just about everything I sell is graded, and anything that isn't is inexpensive and I try to under represent its condition. I have a lot of net/apparent grade notes, but most are rather unusual and there aren't a whole lot of alternatives available. Well, you're smart Scary Bear never buying ungraded notes listed as GEM, Uncirculated or other nonsense that can't be possible or the note would have been graded long ago. I didn't participate in Nationals when I began but now I can't seem to stay away from them. Their are so many different banks and states, it is a whole collecting discipline unto itself. I picked this one up for a decent price as their must have been someone who tucked away 100 or so notes around this serial number from this bank since it was reasonably priced. I'd be interested to hear more about your strategy? Do you stick to a State? A particular bank? I am going after notes with wonderful signatures. Their are some great signatures out there. I bought this one ungraded just for the signature! Surprised it came back a 35 EPQ. And recently picked up his $10 Big Brother. All for Lawrence's signature! Wow, those are amazing! I mainly stick to California nationals (mostly southern California) and scrip/obsoletes (you can see much of my PMG graded collection in my registry sets). I generally go for rarity over quality, all though I try for both (if I could afford it). I like to collect notes from cities and towns I am familiar with, or have lived in. I am kind of a local history buff, and have lived in So Cal all of my life; I find it fascinating to find notes with local connections. If money was no object, I would expand to national notes from every state, probably with a focus on the west. I have a couple of pen signed notes, but most are rubber stamped. 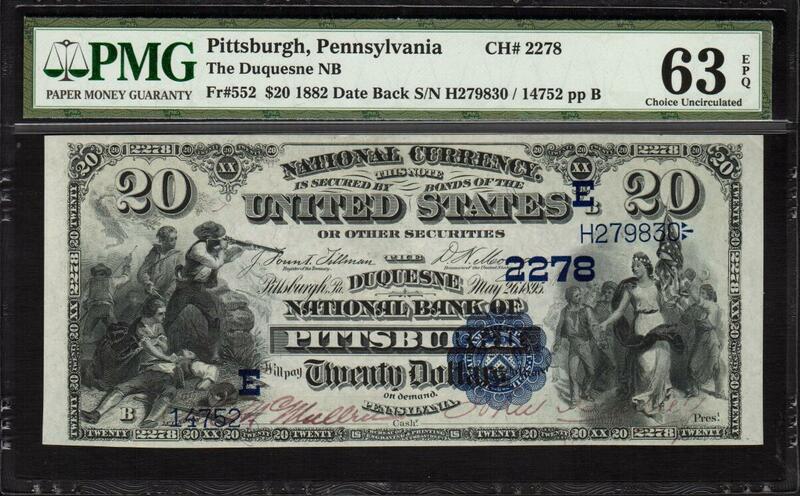 That Duquesne NB $20 VB is absolutely STUNNING!!! 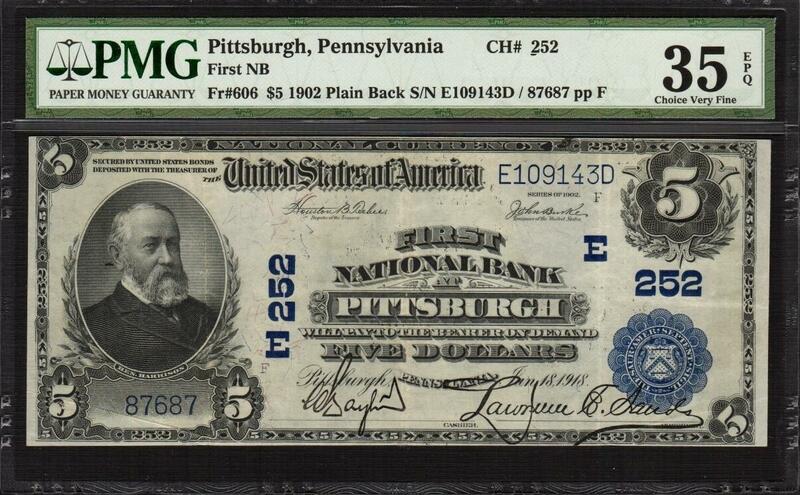 In my opinion, the 1882 $20s are among the most beautiful ever created. I am always amazed that they survived in such a grade. I have a Los Angles example in a lowly VF20. I have never paid much attention to signatures, but I will going forward. Wow, good for you. The only CGA I have seen that went North after PMG graded it. Congratulations, it's a sweet note. I think $50 any things especially FRBN smalls are going to continue to hold their value. 50's seem to be equal in cost to the 100's. I was was going to focus NBN's on places I've lived etc but now I look at the signatures, good quality with good signatures will retained their values well in my opinion. The new owner with excellent provenance. I really like the idea of building a note's history of ownership. Plus Thomas Flynn had great taste. I wish I knew if he were still around? Anyone know? I just picked this one up. This series of notes have the most wonderful reverses. They are great themes in American history,. Here is "DeSoto discovering the Mississippi" I am waiting on PMG to grade it and of course praying for EPQ or at the least no NET.